ALTADENA, Calif. -- Mark Hough had barely taken a sip of his Friday afternoon margarita when he heard twigs snapping and leaves rustling in his lush Altadena, California, backyard. "So I got up, looked over in the bushes and lo and behold there's a bear climbing up over my fence," Hough said Monday. The sighting was the first of many encounters Hough would have with the bear that particularly hot Friday afternoon - over the course of a few hours the bear availed itself of Hough's backyard, his hot tub, and the cocktail he left behind. 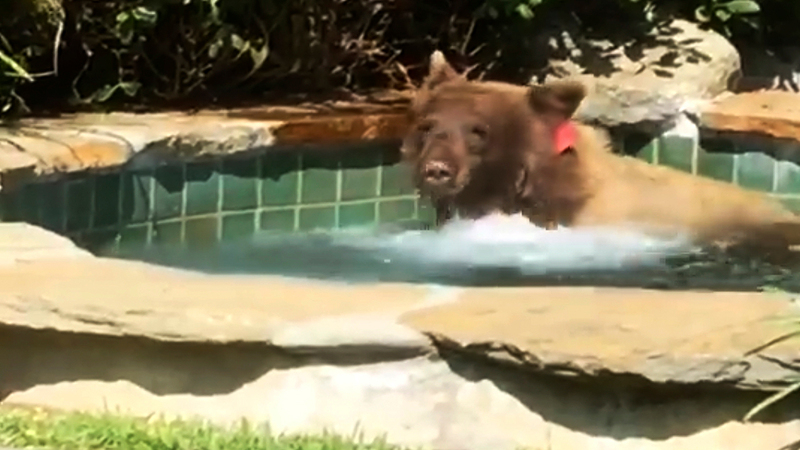 After first spotting the bear, Hough retreated inside, only to later find the furry intruder "bobbling away in the Jacuzzi enjoying himself." "He was playing having a grand old time," he added. Bears have been frequently filmed romping around the community that straddles city and wilderness. Los Angeles County Sheriff's Deputy Joana Warren said the department received six bear-sighting calls that Friday, but failed to find it. The bear's dip only last a few minutes before it emerged and lumbered around the yard. Then it "popped out of the bushes, walked right over to the margarita, knocked it over and lapped it," Hough said.